Originally from Montréal, Véronique Plasse has been active on behalf of Québec musical traditions for more than a decade. Beginning with classical musical training on violin, she studied in elementary and secondary school at the Montréal Conservatory, and went on to study at the Collège Marie-Victorin, all the while performing with numerous traditional groups (Barbo, Hurlevent, La part du quêteux…). She was selected to showcase Québec trad at the prestigious Association of Arts Presenters conference in New York in addition to performing regularly at folk festivals and in concerts in Canada and in the US. Described by those who know her as a tour-de-force, Véronique’s dynamism has led to her job as manager of the Centre du Patrimoine Vivant de Lanaudière, a not-for-profit cultural organization that works to preserve and share music, song and dance traditions in the region and leads a chorale of traditional singers who perform regularly. 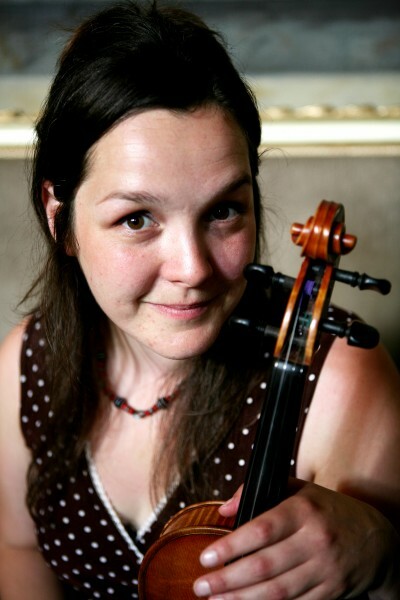 In addition, she has worked as Artistic Director at famed Montréal school Jeunes musiciens du monde (Young World Musicians) and as a professor of violin and voice. Known for her leadership skills, she has been a popular host at Montréal’s well-known sessions at Vice et Versa and ran youth workshops at L’École des arts de la veillée (Société Pour la Danse Traditionnelle Québécoise). As part of her mandate to raise awareness and appreciation for Québec’s traditional music, she created and produced the performance art series “Commando Trad” featuring seemingly impromptu live performances in public places. The initiative was so successful that it has spread to Europe, where artists in France and other countries have picked up the baton, following her format. Véronique is recognized as a gifted performer, arranger and teacher of the music she loves. Québécoise de la région de Montréal, Véronique Plasse se passionne activement pour le répertoire traditionnel québécois depuis une quinzaine d’années. C’est avec le bagage d’un enseignement classique du violon ainsi que de toute la créativité dont elle peut s’inspirer qu’elle amasse dans ses doigts les riches airs portés par la tradition de sa nation. Elle a aussi fait des études en théâtre. Anciennement directrice artistique chez Jeunes musiciens du monde Montréal, professeure de violon et de chant, co-réalisatrice des Commando Trad, violoniste au sein du groupe Hurlevent et pigiste pour différents projets, son parcours fait d’elle une musicienne riche d’expériences et de transmissions musicales.